Shares of Michael Kors Holdings Ltd. (KORS are looking pretty fashionable for investors Tuesday as they rocket nearly 18% higher on first-quarter earnings as of this writing. Despite the sheer size of Tuesday's pop, it's not too late to get into the KORS trade. The violation of the top of KORS' downtrend breaks shares free of the glut of supply of shares that's kept KORS from moving higher all year long, and the path is clear to prior highs up around $50. If you decide to pull the trigger on the KORS trade, risk management remains key. The 50-day moving average has been a decent proxy for the downtrend in 2017. If shares trade back below the 50-day, it's time to sell. In the meantime, buyers are clearly back in control of shares this summer. Michael Kors has been a hard stock to like year to date. Shares have shed about 14% of their market value since the calendar flipped to January, dragged lower by discounting and malaise in the full-priced retail apparel space that had been KORS' cash cow in previous years. But, overnight, Michael Kors is looking markedly different. This morning's earnings release is propelling shares back through breakeven for 2017, and it's putting no shortage of eyes back on this stock. Maybe even more importantly, the technical picture has completely changed, thanks to the momentum reversal that's happening today. In other words, this massive apparel breakout could be just the beginning of an even longer-lasting uptrend. KORS posted first-quarter profits of 80 cents per share, besting the analyst consensus of just under 62 cents. That, coupled with strong guidance for the coming quarter, is driving the upside here. It's been pretty hard to miss the year-to-date downtrend in shares of KORS. This stock has been dragged lower in an orderly fashion since early 2016, selling off on every test of the top of its downtrend, a trendline that accelerated back in November. Now, with today's major earnings gap up, that downtrend is in KORS' rearview mirror, signaling a potential change in this stock's long-term trajectory. 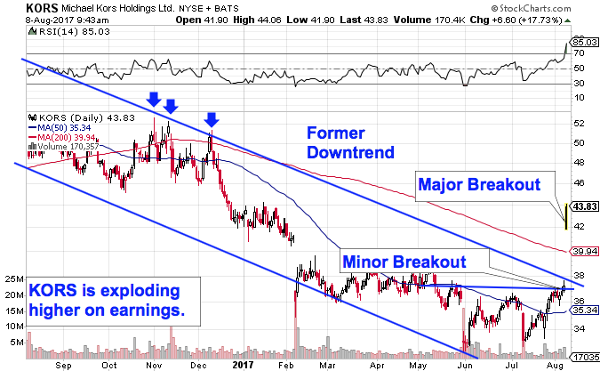 The groundwork for a big up-move in Kors was actually present starting earlier this summer, when shares began forming a pretty textbook example of a double-bottom pattern, a bullish reversal setup that triggered a minor breakout yesterday. While that minor breakout in KORS didn't cause today's move, it likely bears part of the credit for the scale of Tuesday's 18% rally. Without a major resistance level in the way of upside, this stock is free to get bid up through the low $40s.